Today's episode is a little different, in a GREAT way. I asked 14 different podcast listeners about (including me) how they organize their bookshelves … and today I’m sharing their ideas with you. Some readers even provided photos of their methods—keep scrolling to take a peek! Ever-popular genre and color organization came up of course, but we also get to hear about the uniquely-displayed special interest book collections some of you have, including a bookshelf entirely dedicated to one specific period of history, and another home library entirely organized with book-lending in mind. And yes, of course, at the end of today’s episode I’ll tell you about my own shelves. WOW, that has been a journey—and I still keep changing it up! Enjoy today's episode, and make sure to share in the comments how you set up YOUR bookshelves. Allyson's World War II shelf. One of Ginger's "Trivial Pursuit" shelves - History & Theology. Holli's "beauty and function" shelves. 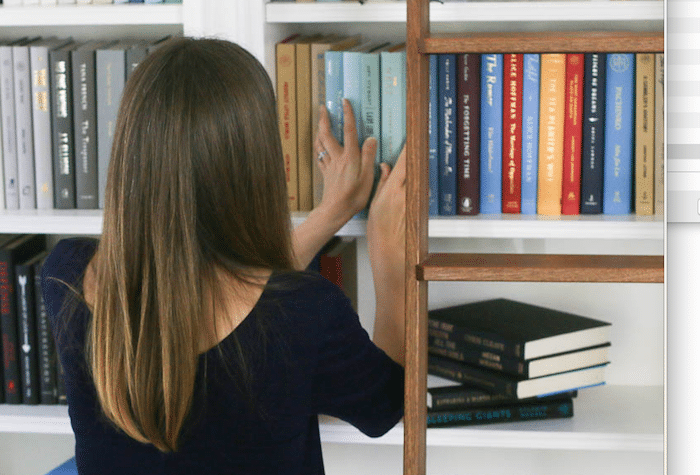 How do YOU organize your bookshelves? Tell us all about it in comments. My question is-where’s the best place to buy bookshelves? That totally depends on what your needs are! My current ones in the library are custom, but we also have shelves throughout the house we love and use from Target, IKEA, Pottery Barn, Arhaus, thrift shops, and probably more places I’m forgetting. It depends on what you like and what your needs are. I love the “To Be Read” bookshelves/bulletin board. I have a bench in the bedroom, and my to-be-read stash is under the bench, where it’s easy to see when I’m getting ready to go to bed. Love your podcasts which I look forward to listening to every week. I am listening to the current one about organizing books and just so enjoying it. In my case, I have four bookcases in my living area. One is all fiction, one is non-fiction, and one is mostly history, biography, and books about readers and libraries. The last one contains my signed titles, classic titles like “Middletown”, local history, and other “special” books – book from my parents so many years ago, original copies of books like “Cherry Ames, Veterans Nurse” (I am a retired VA librarian), “Junior Miss” (I did a book report in eighth grade in which I wrote a negative review and my teacher had me read it to the class). These two I found at a wonderful used book store in Stratford. I also have originals of some social issue novels like “Gentleman’s Agreement”. So that is my favorite bookcase and right next to my desk where I see it when I turn my head. You mentioned Dewey Decimal system. I have suggested to friends that they look for an old edition and get an idea of the general classification that they can use to organize their books. I learned a while ago that I can organize my books in Library Thing (which is how I keep track of what books I own) in either Dewey or LC. So if someone were really into organizing their books in that manner, it would be a good way to go. Most books have CIP (Cataloging in Process) on the verso page so that could be a quick way of looking for suggested subject classification. I have need for a narrow bookcase – fifteen inches wide. I looked online but did not have any luck so I am wondering if any readers have ideas. I think IKEA Billy bookcase is 15 inches wide. Fun podcast this week! 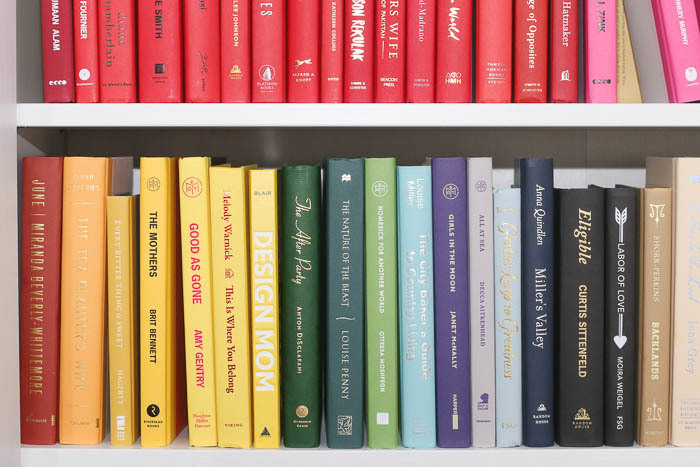 I generally organize my bookshelves like your friend Emily Freeman does, grouped into broad categories and then loosely organized by colors. I also see the cover first when I think of a book, so that’s an easy way for me to find a book. I don’t break up series if the books are different colors, but I have no problem putting the books in a different order if it looks better that way. I also have a separate tbr shelf. I’m one of those people who organizes my books by color. I only buy a book once I’ve read it and loved it, so I don’t own tons and tons of books. Like one of the podcast participants said, I like that organizing by color (as opposed to author or genre) causes me to slow down and look at my books. I’m also pretty good at remembering what color a book is, so it never takes me long to find what I’m looking for. I love your special shelf idea! This is an awesome post! I love seeing and hearing how others organize their books. I’m going to listen to the podcast now, but wanted to say thanks! I have two tall skinny book cases devoted to Christian books: non-fiction, Bibles, Christian living, fiction, devotions. Unfortunately I have only one other book shelf, and I recently cleared all the home school stuff off of it as my daughter graduated last June. That will be filled with all my TBR’s but I have so many it won’t be big enough. Then all my other books I’ve read or collected are currently in bins in the extra bedroom closet. I loved this podcast! I listened while at my desk so I could look at the pictures while people were describing their systems. Then I got curious about your system, Anne. You have such a beautiful library, and I remember you mentioning a few times that you were moving things around (or removing book jackets), but I couldn’t remember if you’ve ever given a full description of how you organize everything. Can you point me to the post if you have done this? Thanks! I don’t think I’ve ever posted about it! Were you hoping for more detail than I gave at the end of the episode? Hahaha! Okay, I get it. Maybe I’ll do this on instagram story? Did anyone mention how they organize their ***digital*** books (mostly what I have left; downsizing soon)? Last I checked (I admit – it’s been a while), there were no good solutions. Seems they should come ready to sort by Dewey Decimal System – or something. I organize mine in a couple of folders – Fiction to read, Non-fiction to read, Read, Kids, and Samples. Thank you so much for including me in the podcast! I was so happy to share how I organize my shelves and even more interested to hear about how others have organized theirs. I love that books and the sheer sight of them can mean so much to so many different people. It’s a beautiful thing! I loved having you—thanks so much! Oh, those shelves all look so pretty! I was going to write in about my book organization (or lack there of) when the newsletter came out, but I got busy with teaching and never got around to it. Our books are not so beautifully arranged But I know which room to go to if I want a particular kind of book. We have book shelves in almost every room of our house. The bedroom has a large shelf with all of our spirituality books, bibles of various types, hymnals, and some of my old religious studies textbooks. The room that is supposed to be our living room is our library with four book shelves. Here we have more of a hodgepodge of books. Literature of various genres, travel, how to, art books, atlases, beautifully bound classic literature from writers through the ages. I have one shelf with my most beloved books. They include our Harry Potter collection, other fantasy collections, the book that contains all of Jane Austen’s works and some sci-fi and mysteries. The kitchen has out collection of cookbooks, my husband’s office has all of his computer books, and more art books. And my office has a large shelf of plays and theatre books, with a few novels. I also have a short book shelf with other novels I love, and a large collection of Louis L’Amour books given to my mother by one of her friends upon his death. There is a small shelf above my computer with theatre textbooks, reference, and writing books. The only rooms without books are the dining room and family/TV room. As I wrote above, the shelves aren’t as pretty as the ones pictured here, but I know where to go and even what shelf to look on if I need a book. Thanks to everyone for sharing their organization tips. What a fun episode. *British Library… not Ritual. Yikes autocorrect! I change my organization system (if you can call it that) with some frequency, but it’s almost always color/size based. I also loosely keep YA separate from Adult, but I think that’s just a size thing. My physical library is very loosely organized so it’s crazy how detailed by Goodreads shelves are. 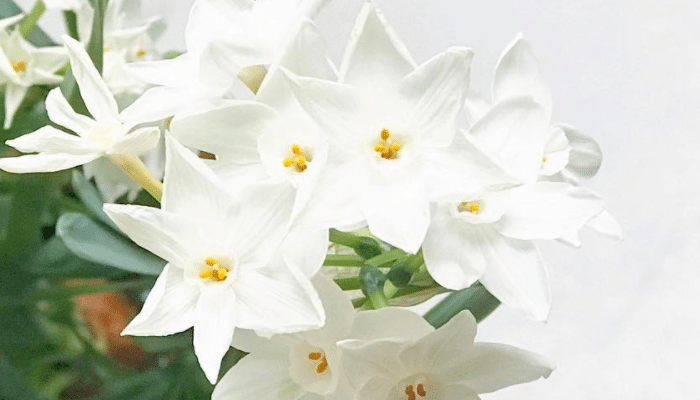 Pingback: At Home with Kate: Elements of a Relaxed Royal Library - What Would Kate Do? I’m currently listening to the backlist of WSIRN when this episode came up. I was wondering if anyone else resists book organization? Although I must have a few thousand books, I rarely need to find a specific one. Instead I love browsing any one of my shelves to see what I stumble upon that sparks my interest or surprises me (I haven’t read everything I own, and frequently forget what I have). And if I do need to find a particular volume, the search is a fun game. I guess series are more or less collected and I have most of the textbooks in my office, but even that isn’t consistent. Am I just weird or is there anyone else out there that enjoys the magic of unorganized books?